What I find inside is often much worse than outside. Folks think it can't get dirty sealed up like it appears to be. Did you find the model number? Did you find the model number? 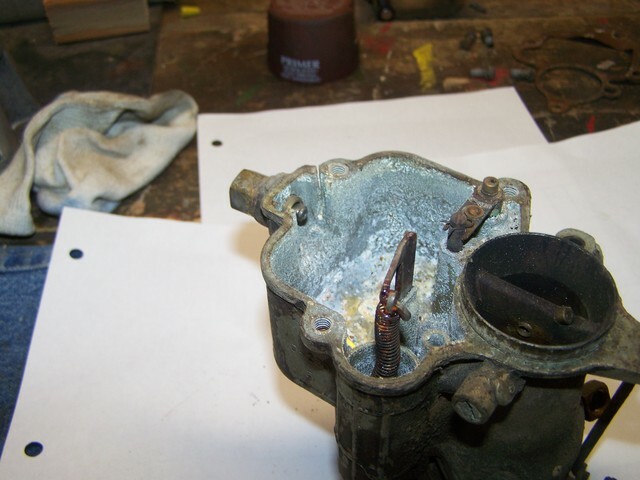 The C6E1 BB carb would normally be found on a 1936-37 Plymouth 201ci flathead six. What motor is in your PW? Not my PW. Ron, the owner, tells me the motor is a T207, is in a '41 Dodge Command Car. Sorry about the mis-I D of the owner. The carb that should be on it is a DTA1 or DTA2. Or equivalent.. If I am seeing the crack where I think it is. In the corner, it doesn't appear to extend into the bowl however. The next time the fitting in the inlet is torqued, the entire corner may break off. What bothers me more is the amount of detritus and mineral deposits in the bowl that may have found its way into the idle passages. It may or may not clean up properly. the crack can be seen here more closely. to the bowl interior it runs the length of the channel that the pin or axle of the float slides into. we are gonna shelf this core and search for a better one. thx for the DTA1,DTA2 info ill pass it along. Good call. Now that I can see the extent of the damage I must agree. And it bolsters my assessment of possible complete destruction when the fitting is removed and re-installed. I've confused myself. Idle mixture screw (the one with the spring). If I open it from 1.5 turns to 2.5 turns, am I making the fuel mixture richer or leaner? Good morning. OUT or OPEN = RICH. Thank you Rick! I have a rattle. At this point, I'm pretty sure it's not a pre-ignition issue, but I wanted to rich up the fuel to see if it changed my noise. Does this rattle occur on a long hard pull? Essentially, yes. It doesn't rattle at idle. It rattles right when I accelerate hard off of idle. No rattle at high RPMs. I'm not sure if it rattles on a long pull yet. I have no plates, so I haven't taken it out of my neighborhood. I'm beginning to think I have a wobbly piston in a sloppy cylinder, but I'm not sure. 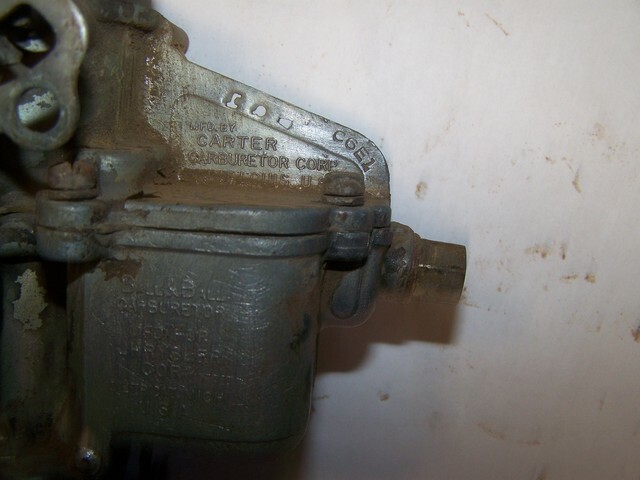 I know this is carburetor talk, but any thoughts would be appreciated. OK. Hard acceleration off idle. In gear or neutral? Last valve adjustment was when? Possible sticking valve getting slapped by the cam. Possible lean condition where fuel flow is restricted momentarily. EDIT: I just went back through your build thread on this one. Do you still have the double action pump on the motor? Which spacer is installed, 1/8”, or thicker? 1/8” should be correct for it. Also I see you were encountering some issues with the WO. Perhaps the Accelerator Pump is hanging up or not getting a full stroke. Maybe the lever has separated. This would also affect the Metering Rod. You might have seen at the HG that I figured out the issue. Pre-detonation. Somewhere along the line, I must have loosened (or didn't tighten) the distributor. It's been a while since I did the work with my vacuum gauge and dwell/tach meter. I had this darn thing dialed in, so I didn't think I had a problem in this zone. Anyway, I had to retardation the timing. The rattle is gone...but...the "window" that I don't have a rattle...but I do have a small backfire out the exhaust pipe, is very small. I'm going to check my distributor advance springs for slop tomorrow. Any other recommendations? That sounds like a plan. Is it kind of like a small “putt…putt…putt-putt”? Mine does that. The motor is 13 months out of full rebuild and I haven’t done a full tune-up on yet it. The distributor is about two years out of rebuild. What I have observed is that each freshly rebuilt carb I put on gets a slightly different operation each time. Sometimes my vacuum gauge needle will bounce one inch. Sometimes its steady as a rock.